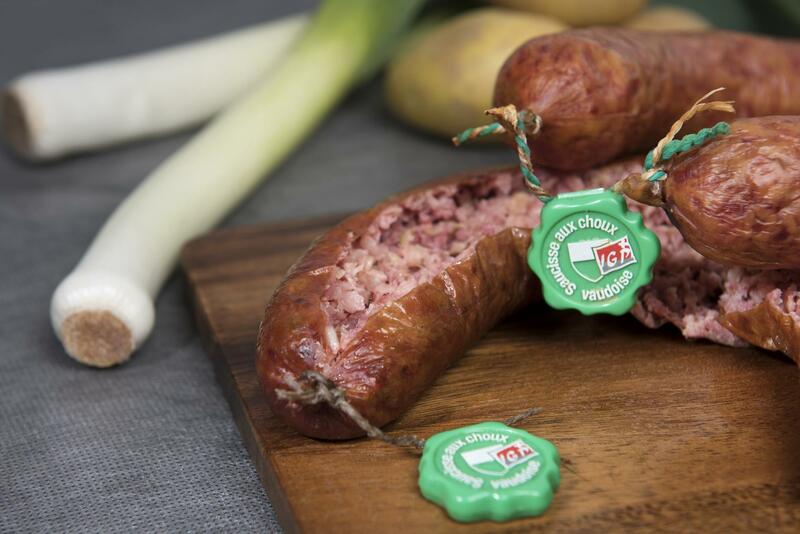 Made of pork meat and white cabbage, the Saucisse aux choux vaudoise PGI sausage is served with the traditional papet vaudois (leeks and potatoes) as the region’s most typical dish. It’s served hot and often whole, which isn’t a daunting prospect for lovers of this smoked sausage. Much-loved by locals, Saucisse aux choux vaudoise PGI was created in 879 in response to the shortage of meat at the time, the idea being to mix cabbage with the sausage meat. Nowadays, Saucisse aux choux vaudoise PGI is made much the same way. White cabbage is mixed with pork meat and liver, put into natural beef casings and then smoked using a traditional technique. This speciality sausage was awarded the IGP (Indication Géographique Protégée) label (Protected Geographical Indication – PGI) in 2004. The sausage has to be cooked for about 45 minutes before being eaten and is served whole or cut in half, generally with the famous “papet vaudois” (a leek and potato mix). To eat, you split the skin and only eat the inside of the sausage. This is also used as an ingredient in more original recipes like hachis parmentier vaudois or Vaudois choucroute.